After a busy weekend of filling the roster, the next decision for Bucks General Manager John Hammond appears to be what to do with one of their own free agents. Point guard Brandon Jennings is currently a restricted free agent and his future in Milwaukee is uncertain. The Bucks will have a week to match any offer Jennings receives on the open market but reported interest on the Jennings front has been quiet so far in free agency. ESPN’s Marc Stein reported a possible sign-and-trade deal that would send Jennings to the Atlanta Hawks. In return, Milwaukee would receive PG Jeff Teague from the Hawks who would also be signed-and-traded. Teams can add an extra year to a deal with their own players, hence the idea of the sign-and-trade. Gery Woelfel of the Racine Journal-Times tweeted later in the day Monday the Bucks were offering Jennings close to his $12-million asking price. The Bucks could also let the market dry out on Jennings and sign him to a 1-year qualifying offer that would allow him to become an unrestricted free agent after next season. That move, however, appears to be unlikely. One other note, Monta Ellis could be on his way to Sacramento. 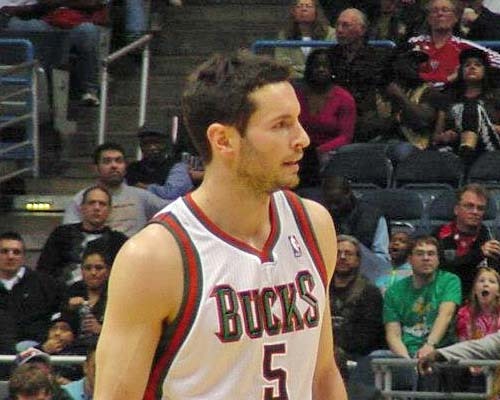 Numerous outlets reported Monday that the former Buck was involved in serious talks with the Kings. One off-season question for the Milwaukee Bucks has been answered. Monday, reports surfaced that guard Monta Ellis would opt out of his contract with the team and become a free agent. Ellis was set to make $11-million next season, the final year of a 6-year $66 million deal he originally signed with Golden State. The Bucks reportedly wanted to sign Ellis to a 2-year, $24 million extension this off-season, which would have been added to the final year of his original deal. Ellis average just over 19-points per game this past season to lead Milwaukee. The Bucks next biggest question becomes the future of guard Brandon Jennings who becomes a restricted free agent when the NBA’s off-season officially begins. For the first time since 2010, the NBA Playoffs will be in Milwaukee. The Bucks host the Miami Heat tonight in Game 3 of their best-of-seven first round playoff series. Milwaukee hosted 3-games in their 2010 series in Atlanta which was won by the Hawks in 7-games. The Heat hold a 2-0 advantage heading into tonight. Miami blew out the Bucks 110-87 in Game 1 Sunday before sprinting past Milwaukee in the 4th quarter Tuesday night for a 98-86 win. If the Bucks are going to pick up a win in the series, they need a better performance from their backcourt. Brandon Jennings and Monta Ellis shot a combined 5-for-22 from the field Tuesday for a combined 15-points. Tonight’s tip-off from the BMO Harris Bradley Center is set for 6:00. After playing a good first half in the series opener on Sunday night in Miami, the Milwaukee Bucks stretched their solid play against the Heat to 3-quarters last night, then went on to lose 98-86 to go down 2-games to none in the best-of-7 series. Dwyane Wade scored 21 points and Lebron James added 19 to lead the Heat. Irsan Ilyasova had 21 and Mike Dunleavy added 16 in the loss. For one half last night, the Milwaukee Bucks were hanging in there, then a couple of 3rd quarter lapses and the Miami Heat rolled to a 110-87 win in the Eastern Conference playoff opener. Lebron James hit 9 of 11 and nearly finished with a triple-double with 27 points, 10 rebounds and 8 assists to lead Miami. The Heat also got 20 points from Ray Allen off the bench. Brandon Jennings had 26 points to lead the Bucks. Monta Ellis chipped in 22 but no other Bucks player scored more than 6 points and combined for a grand total of 39 points. The Bucks did force 19 Miami turnovers, which led to 22 points. But they were out-rebounded 46-31. Game 2 of the best-of-7 series is Tuesday night in Miami before the series shifts back to Milwaukee for games 3 and 4. 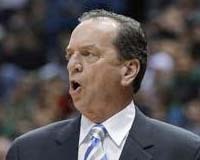 Lawson drained a jumper in the lane with 9.3 seconds left in the Nuggets 112-111 win over the Milwaukee Bucks. Lawson finished with 26 points and Wilson Chandler added 21, leaving the Nuggets 1 win away from clinching the 3-seed in the West.